Many words can be used to describe her presence. Speed, Strength, Grace, Beauty, Style, Poise, Compassion.... She was the perfect blend of all the best traits one would want in not only a public sports figure, but in a human being. When she performed, it was captivating, and could be appreciated two ways: In real time, where the sheer speed was impressive, but its best to watch her runs in slow motion replay, every step is able to be studied and appreciated. This is where Florence stands out from the rest. And when she devoted herself to the charitable causes that gave others help and inspiration, she took my pride as a fellow African-American, immersed it in our country's pride as a representative in world competition, and she made us all as proud as if she were a member of our own families. The world will miss her dearly. 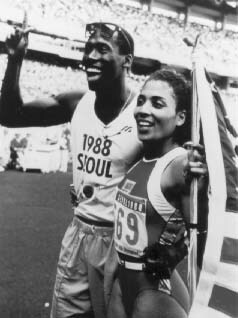 I'm sure she is up there, crossing the finish line in typical Flo Jo style: smiling.Heaven is getting an exceptional angel this time.